Can Transitional Justice Save Democracy? A forward-looking Approach to Dealing with the Past (book manuscript). Can the Number of Veto Players Measure Policy Stability (with Ji Xue) appendix.pdf​. "Infiltration of Religious Organizations as a Strategy of Authoritarian Durability: Causes and Consequences." (with Grigore Pop-Eleches). When do open lists matter? The consequences of the personal vote for party loyalty. (with Royce Carroll)​. Authoritarian Backsliding (with Georg Vanberg and Caterina Ciopris)​. punishment of populists” (with Anna Grzymala-Busse). "Gradual Erosion of the Individual Mandate and the Shift to Majoritarianism in Poland" PS: Political Science & Politics, 52(2): 271-2. "Agenda Setting: the Third Pathway to Voting Unity. Evidence from the Polish Parliament" Studies in Logic, Grammar and Rhetoric 50(63): 181-213. "A Model of Strategic Preemption: Why Do Post Communists Hurts Themselves?" Decyzje 21(2): 31-65, with Marek M. Kaminski). "Tolerating Mistakes: How do popular perceptions of procedural fairness affect demand for transitional justice?" Journal of Conflict Resolution 56 (3): 490–515. "Captured Commitments: An Analytic Narrative Approach to Transitions with Transitional Justice." World Politics 62(2): 341–80. "Lustration and Survival of Parliamentary Parties." Taiwan Journal of Democracy 5(2): 45–68. "Punish All Perpetrators or Protect the Innocent? Comparing Systems of Transitional Justice." Journal of Theoretical Politics 20(2): 221–45. "Judging Transitional Justice: A New Criterion for Evaluating Truth Revelation Procedures." Journal of Conflict Resolution 50(3): 283–408. "Strategic and Normative Aspects of Transitional Justice." Journal of Conflict Resolution 50(3): 295–303. "Gradual Erosion of the Rule of Law in the Shadow of Transitional Justice" in Special Issue of the Journal of Constitutional Political Economy (eds. Monika Nalepa and Emilia Powell). Poland: the Road to Authoritarianism in Paved by Gradual Majoritarian Shifts" in "Decline in Legislatures and Rise in Populism" eds. Irina Khmelko and Frederick Stapenhurst. "The Institutional Context of Transitional Justice." In Handbook of Comparative Political Institutions, eds. Jennifer Gandhi and Ruben Ruiz-Rufino, London: Routledge. 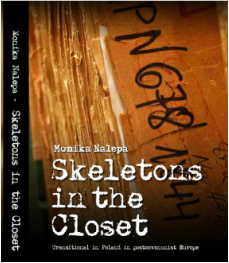 "Critical Dialog [between authors of Skeletons in the Closet: Transitional Justice in Post-Communist Europe and James L. Gibson Overcoming Historical Injustices: Land Reconciliation in South Africa In Perspectives on Politics 10(2). "The Origins of Competing Claims to Land in East Central Europe: In-kind Restitution as a Problem of Fair Division." In Distributive Justice in Transitions, eds. Morten Bergsmo, César Rodriguez-Garavito, Pablo Kalmanovitz and Maria Paula Saffon. Oslo, Norway: PRIO Forum for International Criminal and Humanitarian Law Publication, Series 6. "Lustration as a Trust-Building Mechanism? Transitional Justice in Poland." In Effectiveness of the Accountability Mechanisms in Eastern Europe and Latin America, eds. Monica Serrano and Vesselin Popovski. New York: United Nations University Press. "Lustration." In The Pursuit of International Criminal Justice: A World Survey on Conflicts, Victimization, and Post-Conflict Justice, ed. M. Cherif Bassiouni. Belgium: Intersentia. "Infiltration as Insurance: Committing to Democratization and Committing Peace." In Law in Peace Negotiations, ed. Morten Bergsmo Torkel Opsahl. Norway: Academic EPublisher).